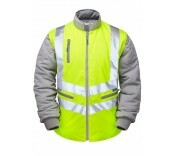 Pulsar® EN471 Zipped Waistcoat Product Description 3M™ Scotchlite™ Reflective Tape. 100% po..
Pulsar® EN471 Long Sleeve Zipped Waistcoat Product Description 3M™ Scotchlite™ Reflective Tape..
Pulsar® Polo Shirt Product Description Thermally applied stretchy 3M™ Scotchlite™ Reflective T..
Pulsar® Long Sleeve Polo Shirt Product Description Thermally applied stretchy 3M™ Scotchlite™ ..
Pulsar® Interactive Sleeved Body Warmer Product Description Original Pulsar® chevron design 3..
Pulsar® Interactive Fleece Jacket Product Description Original Pulsar® chevron design 3M™ Sco..
Pulsar® Interactive Soft Shell Jacket Product Description Original Pulsar® thermally applied ..
Pulsar® Combat Trouser Product Description 3M™ Scotchlite™ Reflective Tape. Durable 275gsm ..
Pulsar® Padded Storm Coat Product Description Original Pulsar® chevron design 3M™ Scotchlite..
Pulsar® Padded Bomber Jacket Product Description Original Pulsar® chevron design 3M™ Scotchlit..
Pulsar® 7-in-1 Interactive Storm Coat c/w Sleeved Bodywarmer Product Description Original Puls..
3 layer, 100% polyester woven twill with highly breathable PU laminate membrane. 3M™ Scotchlite..
Pulsar® Waterproof Overtrouser Product Description Original Pulsar® chevron design 3M™ Scotchl.. Original Pulsar® chevron design 3M™ Scotchlite™ Reflective Tape. Full length YKK® 2-wa.. Product Discription 3M™ Thinsulate Insulation Type G100 quilting for maximum heat retention..